who believe in me because of their word. so that they can be one just as we are one." In the midst of the world's chaos, it should give us great comfort that our Lord prays for us. 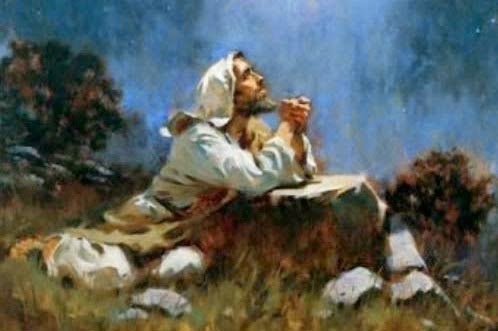 This is not a one-time prayer that Jesus spoke over 2,000 years ago in the Garden of Gethsemane for that time, but a prayer that covers us today. He is in intimate conversation with our Father, petitioning not only for His disciples, (who are the "them" He identifies first), but for "those" who believe in Him because of the disciples' word. It is very important to know the context of time that Jesus is referring to. Jesus is talking about all the people who saw and believed in Him because they heard the preaching of the eleven disciples, or the teaching of Him by the seventy He sent out in pairs. But He is also talking to God about all those who will believe in Him because of the written word of the faithful disciples that would become the Bible. These are two distinct groups ... those that saw and believed; and those that are in the ages to come, who have not seen, yet still believed. And here's the incredible thing: He knows every single Believer that He is praying for! He knows the names that are written in the Book of Life, from the very beginning! And notice what His plea is ... that we will be one; we will be united. He prays that we will be one, not only as a united body of Believers throughout time and in our purpose, but we will be united by the new heart that is created within us -- a heart that seeks the glory of God above ourselves and all else; a heart that yearns for eternal life over the rewards of this world; and a heart that truly desires fellowship at the deepest level with saints throughout the world. This would be the same oneness that the Father and the Son share. It is Christ's fervent desire that all who believe in Him be united in God's Grace and the Counsel of the Holy Spirit. He repeats that He wants us to be one, just as He and God are one. And notice that He asks this so that "the world" will believe that God sent Him. He does not say, "So that "Christians" will believe that You sent me"; or Jews or Muslims or Hindus or any other group ... but that THE WORLD will know! Remember that He sent the seventy out into the world, and He sent Paul to modern-day Syria, Turkey, Greece, Rome and some even think Spain. It is obvious from this prayer, that Christ wants us to all come together as one body of believers; that He would have all men be saved, and to come to the knowledge of His truth. When the world sees that we can all be changed (no matter our nationality or birthplace) and can truly love one another, as Christ loved all men, then there is hope that we can be blessed by the same relationship as Jesus shares with His Father. The disciples and the prophets received "the glory" that Jesus mentions ... the dignity and the honor -- not only for the purpose of testifying about Him, but also so that they could be united in that goal and encourage each other. The same is true for us today.